The Ghost River Valley is a unique and inspiring location. It is a system of canyons carved into the front range mountains, offering spectacular ice routes that pour straight from the rim high above, and winding ice passages in tight canyons. The Ghost contains a high concentration of the finest waterfall ice climbs at all grades in Canada. Off-road-vehicle access ensures that climbing in the Ghost is always an adventure! We can provide a 4×4 winter vehicle for Ghost access – daily rate is $175.00. Stretching from Canmore to Lake Louise, the Valley offers a huge variety of routes in terms of difficulty, access and length. Everything from the mighty Trophy Wall in Banff, to friendly climbs and crags like Grotto Canyon reside here. Weather conditions are often very localized allowing us to find the best conditions for the day by moving from one end of the valley to the other. Whether you are looking for mixed, ice, mulitpitch, cragging, this area holds something for everyone. The most impressive collection of hard routes in the Canadian Rockies are found on the Headwall. This one cliffband has been, and remains at, the forefront of Waterfall Ice and Mixed climbing. Every major route on the wall is sustained and difficult, containing sections of serious climbing. Not for the faint of heart, an ascent on the headwall will be treasured forever. Known as “the ice climbing capital of Canada”, the sleepy village of Field is located within Yoho National Park, surrounded by towering peaks. Over the cliffbands of Mt. Dennis and Mt. Stephen pour dozens of quality ice climbs with fast access. These North facing routes never see the Sun and the ice season extends very late in the year. No Field day is complete without a visit to the good home cooking and coffee available at “The Truffle Pig”. The heartland of Rockies climbing. The parkway stretches from Lake Louise to Jasper running within two National Parks. Roadside glaciers, stunning views of huge peaks, and a multitude of available routes, this is Rockies ice climbing! Classic moderates, challenging alpine lines, and home of the famous ‘Weeping Wall’. Expect a wilderness mountain experience. This easily accessible ice crag offers many ice and mixed routes side by side. Great place for a warm up day, or to work on technique. Always a scene going on here as Rockies climbers work projects and train for the big routes. Another cragging location, offering generally more challenging routes than Haffner, especially of mixed lines. Great for advanced ice and mixed technique sessions. Never as busy as Haffner. Considered by many to be the finest WI3 in existence. This route is located on the edge of the Banff Townsite, overlooking Lake Minnewanka and Mt. Rundle. 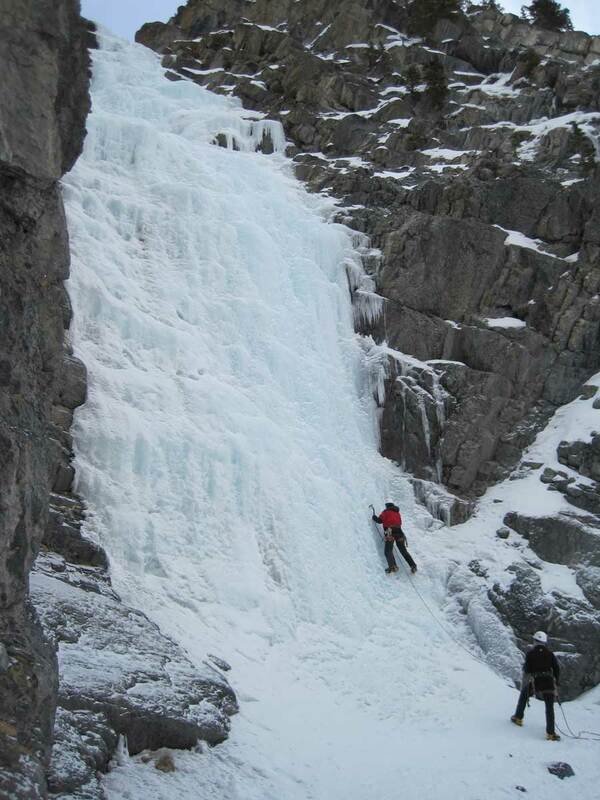 Enjoyable, rambly ice leads up to a hanging forest in six pitches. South facing, a great climb for a cold day. A true adventure. Deep in the heart of the Ghost, we enter a narrow canyon filled with ice. For hundreds of meters we follow this winding canyon climbing many stepped pitches. This area has an otherworldly feel, dry, desolate and haunting. An ultra classic mini alpine climb. It combines ice, rock and snow, all at a moderate grade and high quality. Several waterfall ice pitches lead to snow gullies and rock bands. Fossilized rock accepts trad gear in the crack systems. We wear our crampons the whole way! This climb is a great experience for those who want a taste of winter alpine climbing, without the miserable bivy and long approaches that are so common to the sport. Awesome Trad-mixed climbing on the solid Quartzite of Mt. Stephen. Located on the first cliffband of Mt. Stephens 5000ft NW face. Great starter climb for those wanting to try out a mixed climb multipitch. Fast approach and descent. Warm up on fat Grade 3 ice which takes us to a huge ice cave under the crux pillar. Next pitch, short and steep, sometimes with a cool roof, going over the crux. A final pitch ends with a few root hooking moves and then we walk off. Crowds of tourists get to watch the show from far below. Located by Château Lake Louise under the majestic Mt. Victoria. This is one casual approach, which partially accounts for its popularity. A Rockies Classic. Steep steps of ice followed by flat benches and canyons, this route journeys up and into the North face of humungous Mt.Rundle. It is one of the first routes to form, and last to melt out every year. This makes a great introductory multipitch grade 4 route, and is a good cardio work out as you cover allot of ground. Starting from within the townsite of Banff, an hour hike alongside the Bow River leads to the base. The most famous ice climb in Canada. Vertical skating rinks of ice plastered to a South facing cliffband. Many route options, from sheets of Grade 4 ice to engaging WI6 pillars exist. Cool ice caves, and long pitches are the highlights of this route. For those up to it, Weeping Pillar looms above. Without a doubt one of the best routes in the Ghost. Three steep, fat and plastic pillars lead to easier ground. Remotely situated deep in the Ghost, the atmosphere and surroundings are rare. Some rugged driving leads to a 45min. casual approach. This climb is not well known nor traveled, which is all the better for us! This stunning route is set in the back of an amphitheatre with steep walls all around. The upper column allows two steep pitches of excellent climbing in an outrageous position. It gets rave reviews, and is as fine a climb as you can get. “The showpiece of the Canadian Rockies and a must for all climbers! It offers nine pitches of generally moderate ice gradually steepening to the final crux pitch.” The highlight of many an ice climbers career. This climb just keeps on going! and its quality the whole way. Descent is back down the route on bolted anchors. One to aspire to aspire to. A spectacular and sustained waterfall plastered on the back of a cirque amongst massive rock walls. The route maintains its steepness for three good rope lengths on featured wild ice. It sports a crux pillar and technical ice on pitch two. Only 150m long, but you will be worked by the end! The definitive hard ice climb when first ascended, S.O.V. often forms much fatter now. It still remains a proud tick and an amazing line. Stuck to a vertical cliff miles above the valley below, the exposure is out of this world. Bordered by the impressive climbs the Terminator and the Replicant, creating the ultimate tri-fecta of routes on the Trophy Wall. This route is the finest mixed climb of its type in the Rockies. Scottish style ice gullies, a well protected traverse, and a finishing 10inch wide vein of ice give this route plenty of character. It has the feel of an old school alpine climb more than new-wave mixed climb (i.e. no overhanging roofs on this one). Highly recommended. Legendary and challenging, Nemesis is a rite of passage for all aspiring hard ice climbers. Steep and technical, high exposure and funky ice, all combine to make this route a proud tick. First ascended in 1974, it was the hardest ice route in the world at the time. It’s grade has not been downgraded, and retains a stout reputation. Located at the back of the Stanley Headwall, we pass under such testpieces as Acid Howl, Suffer Machine, and French Reality on the 2 hour approach. Expect a full day out. Do you want to find out what hard ice is about? Check out the guidebook description of this route “climb psycho bobbles of unconsolidated ice, funky overhanging mushrooms and steep pillars” This fearsome and awe-inspiring route offers two full rope lengths of engaging climbing, demanding your best. Step up to the plate! An ultimate climb, pure quality. Its difficulty depends on how well it forms up, which varies considerably from year to year. What remains constant is the excellent climbing in a stellar position. Thin ice with a few rock moves thrown in, stubbies and pitons see us through the lower chimney. Then steep exposed waterfall ice (90+degrees) bring us up to a cave high above the valley below. *Please add 5% sales tax to the above amounts. *There may be additional expenses such as food, gear rental, park fees, transportation or accomodation. *Half, full, and multiday trips available. *Maximum 2:1 ratios on multipitch climbs. For larger objectives or routes with increased hazards, there may be an additional charge applied to your booking. Mountaineering/Alpine Rock days that exceed 10 hours in length, rock climbs that are longer than 400 meters, or ice climbs graded WI5 or higher are good examples of when this surcharge would apply. You may also need to demonstrate the ability and experience required to your guide. Prep days or training days are not uncommon, and can be arranged to see if you’re ready for your chosen BIG route. Surcharge amount can be $200.00 or more per day. Please contact us if you think your BIG route may fall into this category. For further information and to reserve your guide, visit our Bookings Page or contact us.